Frezyderm SA is a leading Greek company that develops, manufactures and trades dermoceutical products and medical devices, owning one of the most valued R&D Departments and a cutting-edge technology factory. Since 1986 when established, FREZYDERM provided strong cooperation with doctors and Universities, innovations and revolutionary formulations, close relationship with pharmacists and a continuously, fast growing process, thus becoming one of the leaders in Pharmaceutical market. Nowadays FREZYDERM is committed to provide its business partners effective and high quality dermoceuticals that help to improve skin health and thus a higher quality of life, along with successful B2B strategy, sales and marketing support. 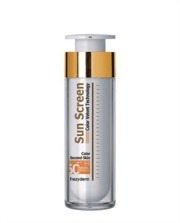 Face sunscreen with color coverage & velvety matte finish with very high protection. Protective, waterproof cream to be used after diaper change. Alternative to cortisone, cream that reduces inflammation, irritation and reinforces dermal barrier. Categories affiliated with FREZYDERM S.A. Send inquiry to FREZYDERM S.A. Your message will be sent directly to FREZYDERM S.A. and will be answered at their discretion.